...the 53rd Fort Lauderdale International Boat Show, October 25-29. inReach has also been nominated for the esteemed Design Awards METS (DAME), recognized around the world as the most prestigious design competition for new marine equipment and accessories. inReach is the world’s first affordable two-way communication solution and allows boaters of all types to stay connected when voyaging on waters beyond cell phone range. 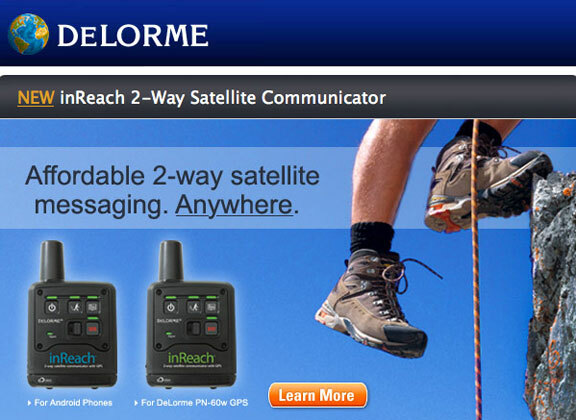 inReach provides two-way text messaging and email, SOS alerting, message delivery confirmation, remote GPS Follow-Me/Find-Me tracking and locating, and worldwide global coverage over the Iridium® satellite network. The device is compact, lightweight, waterproof, buoyant, impact-resistant and it can maintain satellite signal lock even in difficult GPS environments. For boaters on a day-long cruise, extended voyage or remote fishing expeditions beyond traditional cellular coverage, inReach provides two-way communications capabilities and emergency alerting anywhere on the open waters. inReach can be used as a standalone device or can also be paired wirelessly with popular smartphones and tablets, enabling interactive text messaging and emails. inReach automatically transmits its GPS position at regular intervals. Friends and family can log onto DeLorme’s Mapshare website to view the sender’s latest position, breadcrumb trail and message history on a map display. They can also ping the inReach at any time to get an instant update of its current location. In the event of an emergency, the inReach SOS button, which has built-in protection against false alarms, will trigger a distress alert with delivery confirmation. inReach takes the ‘search’ out of search-and-rescue by automatically activating remote tracking for any SOS alert and sending message and tracking data to an international search-and-rescue coordination center, providing frequent updates of the user’s GPS position coordinates. This allows rescuers to efficiently hone in on the user’s location, whether stationary or on the move. It also allows search-and-rescue authorities to communicate with the user to ensure that it is not an accidental activation, determine the nature of the emergency and reassure the sender that help is on the way. BoatUS, a West Marine and DeLorme partner, is also offering a special program to make inReach satellite service available to contact TowBoatUS and Vessel Assist. Additionally, DeLorme recently introduced the new inReach Auxiliary Power Adapter (APA). Especially designed for inReach, the APA conserves batteries and maintains power to the device via connection to a standard 12V cigarette lighter outlet. inReach operates over the Iridium satellite network, providing truly global two-way satellite communications, high network reliability and low-latency data links of less than 60-second delivery of messages end-to-end anywhere on Earth, even in areas outside of traditional cellular coverage. DeLorme is exhibiting in TrawlerPort Booth 1606 at the Fort Lauderdale International Boat Show.